Have you ever heard the phrase “It’s not what you know but who you know?” Keep this in mind because it has a lot to do with the theory behind the Strength of Weak Ties, originally penned by Mark Granovetter (American Journal of Sociology, May 1973, pp. 1360-1380). Granovetter’s hypothesis, however, is that who you know is even less important than who you kind-of know. What this means is the best way to use your social network effectively—whether professionally or personally—is by using your acquaintances and casual connections (weak ties) rather than your close friends (strong ties). This perspective essentially explains that your strong ties, while very powerful on a smaller scale because of high emotional intensity and frequent interaction, do not help you branch out because your strong ties tend to be contained with a smaller social circle. Weak ties on the other hand act as bridges between social circles, groups, and communities. We believe our online social networks need to better represent this model and emphasize both our weak and strong ties. As Granovetter outlines, strong ties are your close group of friends and family. Weak ties are more often acquaintances and friends-of-friends. Determining the strength of a relationship (i.e. : tie) can be calculated by evaluating certain micro-properties: (i) amount of time the tie has existed, (ii) emotional intensity, (iii) intimacy or mutual confiding, and (iv) reciprocation. The ability to influence the broader social network can similarly be measured by analyzing macro-properties: (v) diffusion of information, (vi) social mobility, (vii) political organization, and (viii) social cohesion. Micro-properties (i-iv) are associated with strong ties and macro-properties (v-viii) correlate with weak ties. –Strong ties create a powerful emotional rapport between people and are manifested by close relationships. Your strong ties are more likely to have similar or identical perspectives and access to the same information. 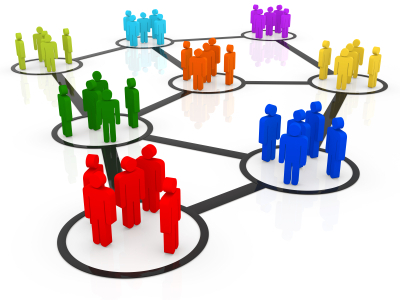 –Weak ties bridge the gap between different social circles (communities) and connect dense clusters of strong ties. Weak ties are often represented by casual friendships and connections and are people more apt to tell us things we don’t already know. Both strong and weak ties are needed to create a powerful social network. Without both of these types of connections you are either shut off to the world outside of your close friends or part of a vast web of distant, meaningless connections. The Strength of Weak Ties theory was first published in 1973 and explored interpersonal connection in the real world, not the online world. Granovetter’s perspective is now a widely-recognized and generally accepted analytical understanding of how our interpersonal networks work. But if this was written in 1973 before the Internet even existed, then how is this relevant to today’s online social networks? Social networks have evolved to almost entirely ignore the power of a person’s weak ties, emphasizing instead the cluster of strong personal ties a user has. We have accepted the idea that our ‘online social’ selves are to be considered accurate representations of our real-world selves, but the social networks we have access to online are complete misrepresentations of how real-world interpersonal interactions are supposed to work. But how does this really damage the social experience we have online? You may argue that our social networks focus on our strong ties, while the rest of the Internet gives us access to weak ties through tools like Facebook Connect and the Like button. You could go further and argue that we do have inherent weak ties on Facebook and other social networks because not all of the people on Facebook are our good friends. These arguments are valid, but we think there’s a better way. Facebook Connect and the Like button are not accurate representations of how our weak tie networks actually work. They are tools that simply allow for interaction with weak ties, but that interaction doesn’t make those people relevant to our broader social networks and gives absolutely no context to the real world that we live in. And it is true that not all of our connections on Facebook are strong ties, therefore they must be weaker ties. However these are pre-existing connections that were established offline. It’s not so easy to meet new weak ties online. Call us naïve, but we think it’s important to enjoy the different ties and communities that are only available by discovering new weak ties. And we want to know how those connections are relevant to us the same way we can in real life. We want an online social network that has both strong ties and weak ties. Everyone knows which people in their lives are their strong ties and, in general, they also are connected with these people online. But our weak ties aren’t always so obvious. That’s one reason we want OurPangea. It empowers us to discover and use our weak tie network. With OurPangea you see how your weak ties fit into your world. You can see the similarities you have with any network—any community—on this planet. OurPangea becomes a window to the world through the eyes of any community you want to view it through. Imagine the power and collaboration made possible through being connected to every community and culture on Earth. That’s what we imagine with OurPangea. ← The Internet is a Community…Well, sort of. As our past intern Alex Ricard put it, “It’s not for you to help us change the world, but for us to help you change the world.” What you need to know is we will change the world. We're all about building stronger communities. We want to create a world where community is visible, attractive, and accessible for everyone. No more wondering and no more wandering about your city to find new friends – wander around OurPangea and discover entire communities.